There was an old song “It’s almost tomorrow”. My father was a bit of a dancer and he used to waltz around to this song playing on the record player with me standing on his feet. And YES!!! It is almost tomorrow. The great ship Shannon stands on the slipway. Workmen are greasing the rails. The seagulls hold their breath. The Queen is choosing a frock…. My Pinterest reveal tour is nearly over. Today I’m grateful to harliesbooks for hosting my feature on painted ceilings. When Shannon gets to Venice she looks up at the ceiling of a fabulous palazzo on the Grand Canal. The art was painted by the famous Venetian painter, Tiepolo. I have tried to make all the settings of the book “real”. Let’s just say that fact is blended with fiction. The actual painting shown in the photo is from the throne room of the Royal Palace in Madrid. 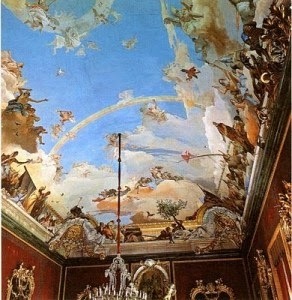 Maybe Tiepolo did an earlier study in Venice or maybe he didn’t…..If he did it’s in the Palazzo Coccolare. The only access is via Shannon’s Law. Emma thinx: Fiction exists and that’s a fact. This entry was posted in harlies books, Palazzo Coccolare, Shannon's Law, Tiepolo. by emmacalin. Bookmark the permalink.